Animal Wildlife | Rattlesnake | Rattlesnake are poisonous snakes that belong to the pit viper group and are recognized by the distinctive rattle on the end of their tail. 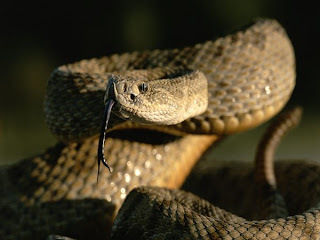 Rattlesnake is comprising the genera Crotalus and Sistrurus of the pit viper subfamily Crotalinae and the viper family Viperidae, characterized by a triangular head, a heat-sensing pit organ located between the eye and the nostril on either side of the head, and a rattle at the end of the tail. Most species of rattlers have hemotoxic venom that attacks tissues and destroys them. 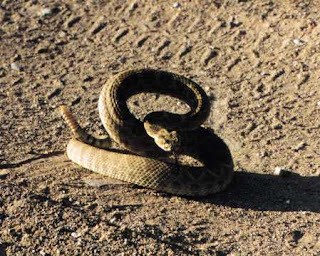 The Mojave rattlesnake also has a neurotoxin in its venom making it the most dangerous of all the species of rattlesnakes. While rattlesnakes are often viewed unfavorably, because of their ability to inject into humans a dangerous, even deadly, amount of venom, they are largely an avoidable danger, whose defensive attacks on people can be limited by proper precautions: wearing boots in rattlesnake area, not threatening the snakes, and being aware of just how very fast and how far they can strike. Furthermore, the very rattle that gives them their name provides a warning signal. Ecologically, rattlesnakes help in the balance of nature, regulating populations of rodents and other small vertebrates. For humans, they also add to the wonder of nature and have served as food, being popular in some southwestern cuisines and sometimes sold in specialty meat shops. Rattlesnakes vary considerably in color depending on their habitat. In the western states the author has observed pinks, greens, rust colors, and almost black. They tend to blend well with their background. Some species are more reactive to threats than others, but most would rather run away than have an encounter with a human. They use their heat sensing pits on their faces to "see" heat images. They track wounded prey by following its heat signature. They use their poison to subdue their prey, small mammals like rabbits and mice. The venom starts digesting the prey from the inside before the snake even swallows it. Most rattlesnakes mate in the spring. All species give live birth, rather than laying eggs. The young are self-sufficient from birth. As they do not need their mother after birth, the mother does not remain with her young. 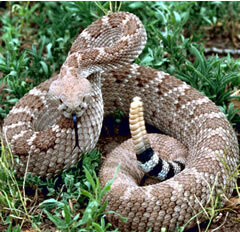 Rattlesnakes consume rodents, such as rats and mice, as well as other small animals, such as rabbits. They subdue their prey quickly with a venomous bite as opposed to constricting. They are specially known to strike at distances up to two-thirds their body length. 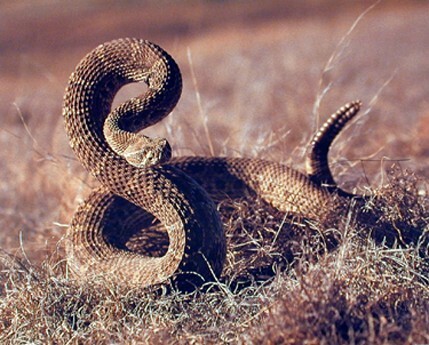 The venom stuns or kills typical rattlesnake prey immediately. 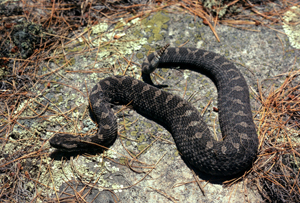 A rattlesnake will follow prey that does not quickly succumb to the venom and attempts to escape.